For building U-Boot, use the INet_3FBT target. This board has a separate barrel socket for a 5 V power supply, however it will also charge off the micro-USB "computer" port. There is a reset button next to the UART pads accessible through a hole in the back of the case. The Vol+ (middle) button triggers FEL mode. 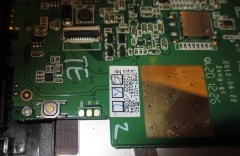 Wifi chip is part of a shared Wifi/Bluetooth module called iNet i10 T0C601C. This has a Broadcom BCM40183 chip embedded in it. Remove two screws from the connector side. Carefully insert your plastic tool between the metal back cover and the frame, and gently push the frame to the outside until the clips release. Go all around until all clips have release. Since the Kogan Agora tablet has the same case as the Eken A90 style tablets, this youtube video might also help. Be careful when opening the device though, as the speakers are glued to the back cover. The UART pads are nicely silkscreened on the board, under the touchscreen cable, right next to the reset button. All you have to do is solder on some wires according to our UART howto. 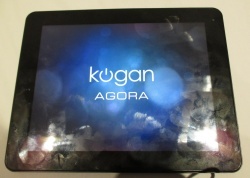 Kogan Agora 10" 16 GB (as documented on this page). The Inet 3f is a cut down version of this tablet, lacking bluetooth. This page was last modified on 29 June 2015, at 02:16.